US NAVY warships are set for a futuristic upgrade amid fears World War 3 may break out with missile-obsessed North Korea. KIM Jong-un has been hit with an ultimatum by Britain to scale back North Korea’s human rights abuses. Prime Minister Theresa May is backing the US in ratcheting up the pressure on the hermit state after numerous missile tests.Nuclear war is looming with world powers ganging up on North Korea.And with US citizen Otto Warmbier dying in prison after taking down a propaganda poster, Britain has issued a threat of its own. The US Government has announced a “Geographical Travel Restriction” which will prevent Americans from entering North Korea. The less US citizens in North Korea, the less potential American hostages are there for North Korea to take. Despite these and other actions, should war break out, this would NOT be World War III. Though, how the USA and UK handle such a conflict may upset the Europeans, Chinese, Russians, and others who may have involvement in WWIII. The USS Ford is named after the country’s 38th president, who rose to the rank of lieutenant commander in the Navy during World War II. The warship joins the Navy fleet behind schedule and at inflated price tag of $12.9 billion. 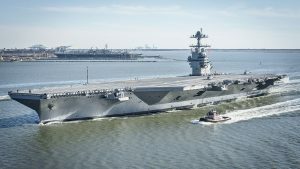 The Navy blames the delays and cost overruns on the ship’s state-of-the-art systems. This aircraft carrier has been in the works for some time, but now could be used in a conflict with North Korea. At this instant, it is not obvious that North Korea’s leader Kim Jong Un is shaking with fear–though perhaps he should be as the USA seems to be going over several military options related to North Korea. In addition to that new carrier, the US has been testing its Terminal High Altitude Area Defense (THAAD) system (see US claims a successful THAAD test: A message to North Korea?). The US wants more THAAD systems in South Korea in the event of conflict with North Korea. The hope is that THAAD could knock out missiles from North Korea so that less would die in South Korea. Three months ago (on April 11, 2017), Donald Trump sent the following from his Twitter account: “North Korea is looking for trouble. If China decides to help, that would be great. If not, we will solve the problem without them! U.S.A.” Donald Trump, if he is looking for a military solution, likely has enough statements and actions from North Korea to legally ‘justify’ one, though the North Koreans also think the same thing. Internationally, Kim Jong Un and US President Donald Trump are both considered to be unpredictable. The USA wants to change the situation in North Korea, while North Korea seems willing to risk itself against the USA (e.g. North Korea launches ICBM and says it can hit anywhere: What will Donald Trump do?). North Korea will NOT continue as it has been. It has severe economic problems and leadership issues. Its people have been suffering for decades and are in my prayers. In my view, North Korea will one day reunify (at least to a degree, if not totally) with South Korea. Because of prophecies involving “the kings from the east” cooperating at the end (cf. Revelation 16:12; Daniel 11:44: “news from the east and the north shall trouble him”), we in the Continuing Church of God have long felt that somehow North and South Korea would likely be unified (or at least work more closely together) prior to the return of Jesus Christ. It could take military conflict for that type of unity to happen. This may not turn out well for the North Korean leadership. While the USA can defeat North Korea militarily, understand that North Korea could try to set off a nuclear device (either through a launch or through some other means, including covert terroristic ones) or take other military actions that could hurt South Korea or the USA. As reported here a couple of days ago, some believe it may attempt to hurt the USA through electromagnetic pulse (EMP) weapons (see North Korea poses electromagnetic-pulse threat to USA). While we are in the ‘beginning of sorrows,’ the end is not yet. Why? Because other events in the Bible, such as those that Jesus spoke of Matthew 24:9-20 have not happened yet (see also When Will the Great Tribulation Begin? 2017, 2018, or 2019?). That being said, Jesus spoke of a time of troubles prior to the Great Tribulation (Mark 13:8) and North Korea may well fit in with those (we also have a video related to some of this, which is titled: Syria, North Korea, and Prophecy). We are hearing rumors of war and seeing steps that point in that direction. This entry was posted on Saturday, July 22nd, 2017 at 3:00 pm	and is filed under Prophecy.